Supplemental material reads: "1958-01-10. Early Monday. Photographer: Gershon. Subject: 14,000 miles (Vails). Location: Wilmington. 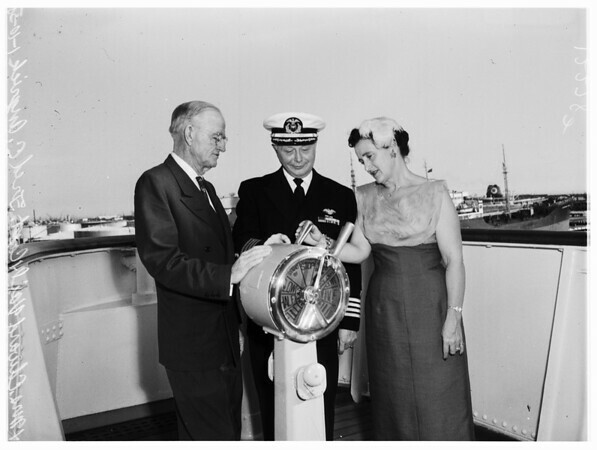 Names: Mr. and Mrs. Edward Vail get instructions on reading compass ring from Captain Fred E. Angrick of American President Liner President Wilson. They are on 14,000 mile around-Pacific-voyage after traveling nearly that mileage from Santa Barabara to Santa Rosa Island during past dozen years. He is vice president of ranch on island and part owner of the island".